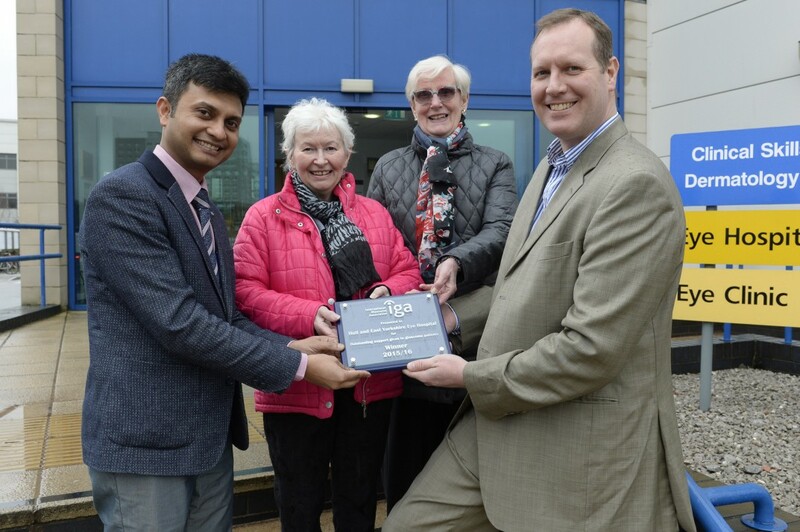 An international award has arrived in Hull after local people under the care of Hull and East Yorkshire Eye Hospital showed their support for the service. The International Glaucoma Association (IGA) launched its search for the ‘ophthalmic unit most appreciated by patients for quality of service’ back in late 2015. Members of the Hull and East Riding Glaucoma Group responded by nominating Hull Royal Infirmary’s Ophthalmic Unit for the IGA ‘Ophthalmic Unit of the Year 2015/16’ award. The unit has been recognised not only for its clinical skill and expertise, but also for the all-round support it offers to patients who are vulnerable to sight loss or impairments. Over the past decade, the unit has increased its capacity and has been leading the way in terms of treatment, by using some of the latest surgical and laser techniques. A new technique has even been named after the city, and the unit now boasts a dedicated team of staff who, in the words of one patient, “don’t just go the extra mile, they run a marathon”. “As someone who has been under the care of the unit, and Mr Burnett in particular, for a number of years, I’ve always been so impressed by the professional, conscientious and caring way in which he and his staff carry out their duties. Without his care and attention, I would possibly have lost my sight eight years ago, but thanks to their work, my condition is stable, my vision is good, and I no longer need medication for it. “The team gives patients like me the feeling of being cradled in a safety net of support, answering questions, providing information, and offering advice. Mr Burnett and other staff members are always willing to give their time and professional knowledge to our local support group when approached, and this helps us to achieve our aim of increasing people’s knowledge and understanding of glaucoma. At the end of last week, Mr Craig Burnett, Consultant Ophthalmic Surgeon, Sudipto Bhatta, Consultant Ophthalmologist, and Pat Savage, Glaucoma Nurse Practitioner, travelled to London to collect the award. “We are extremely grateful to receive this award and genuinely touched to hear such kind words from our patients. We are also very pleased with the success of the local patient support group, the Hull and East Riding Glaucoma Group. We always strive to achieve the best possible results and this acknowledgment, from our patients & the International Glaucoma Association, makes all the hard work worthwhile. “Over the past decade, our Department has seen huge improvements. The Glaucoma Service has implemented the most modern techniques to treat the condition and we have expanded to address the increasing demand on the service. However, we will not rest on our laurels as we are aware that further improvements are needed. “We are delighted to recognise the Hull and East Yorkshire Eye Hospital for our “Outstanding Support for Patients Award” for 2016. The unit was nominated by IGA members who recommended it for its excellent service and praised the dedication and commitment of the staff who run an active patient support group for people with glaucoma. “The glaucoma service and the entire Ophthalmology team in Hull are delighted to receive the IGA 2016 award and we are extremely grateful to our local Glaucoma Group who believed in us and have deemed us appropriate for the nomination. “We are in exciting times with evolving newer technologies. We have recently expanded the glaucoma service by establishing new clinic pathways with electronic reporting systems for patients to be reviewed in a timely manner; started the new Laser Trabeculoplasty service; and are rolling out new micro-invasive glaucoma surgery in the region. This has all been possible due to the hard work of the team and additional support from Colin Vize, our consultant colleague & Medical Director at the Trust.